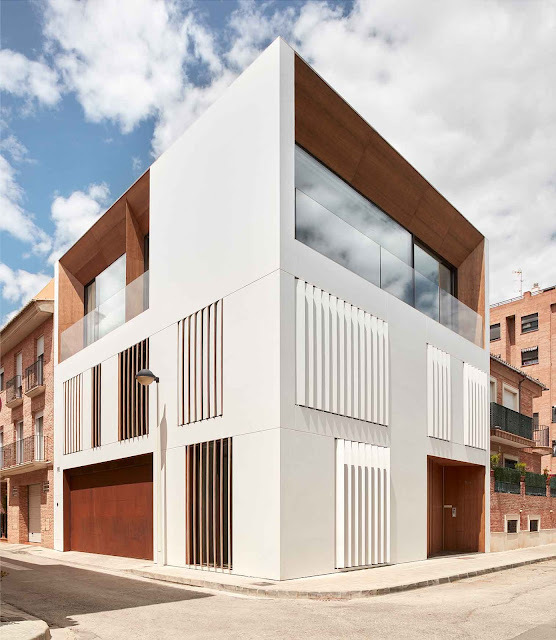 This Home in the Orchard, designed by Ramón Esteve Studio, is located in the village of Alboraya, in the border area between the urban grid and a great extension of a vegetable and tiger nut garden. It is a house between medians located on the corner of a residential block and therefore enjoys the convenience of urban housing and at the same time, it has its broad views over the orchard that fades into the horizon. 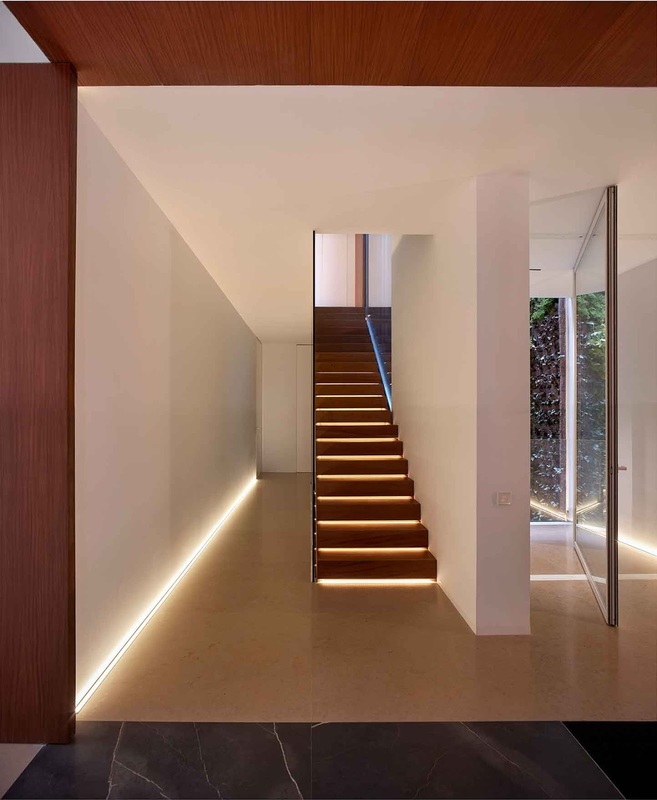 To resolve this project it is proposed a clean and geometric surrounding, white and abstract to which, will be applied some perforations that generate the openings of the house. These subtractions reveal a wooden interior of great warmth that contrasts with the purity of the rest of the facade. 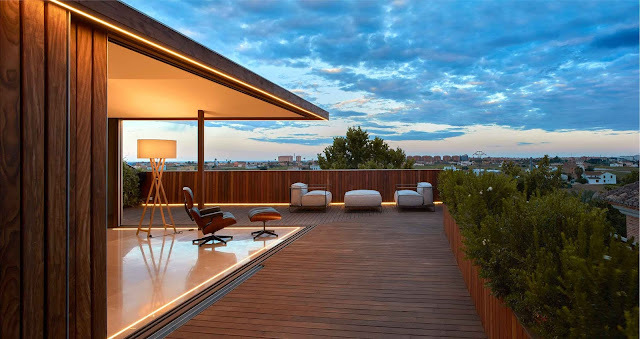 The splatters of wood marked the accesses, both the pedestrian and vehicular, the balconies of the kitchen and the living room and large terrace- vantage point that crown the housing. The rest of the gaps are closed with motorized planks of white krion on its outer face which when opened, show the interior of the wood. 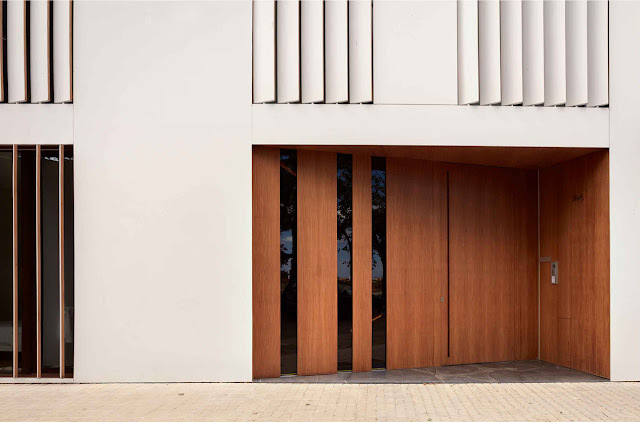 The facade is the result of the combination of a few large white cloths of krion, some splayed arched of IROKO wood, and the slats, which, according to their position, texture and materiality varies. All these elements are arranged within a sealing system that binds the whole. 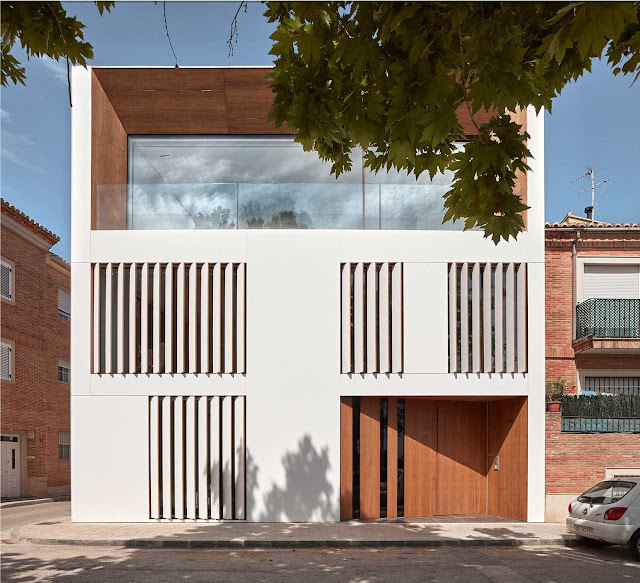 The divisions of the facades and the combination of materials and textures create a xture that reminds of the typical subdivisions of the vegetable garden. 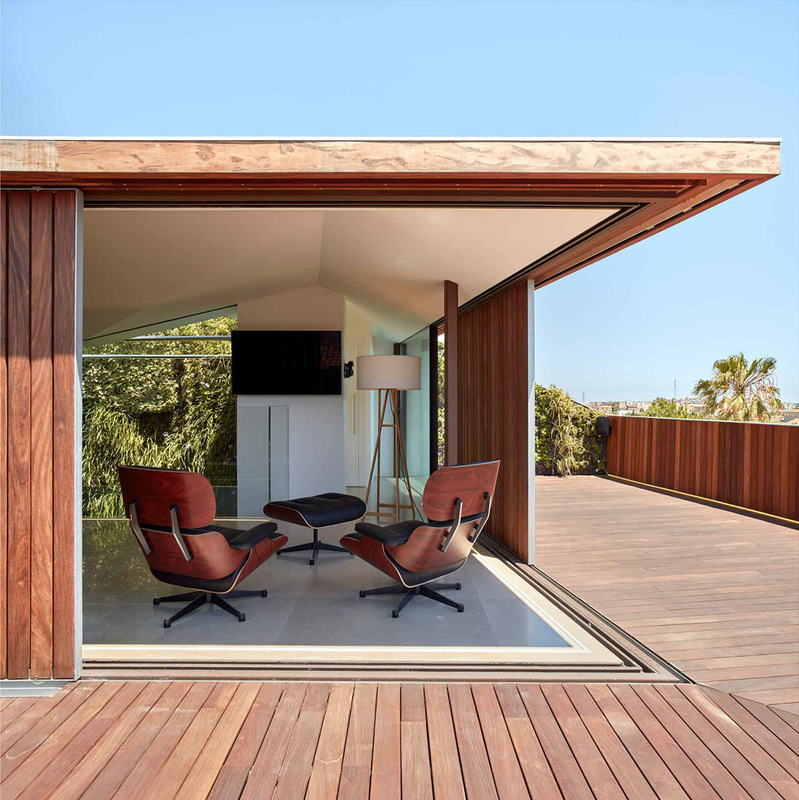 A hipped roof to reinforce the surrounding abstract of the house prolongs the nature of the facade. 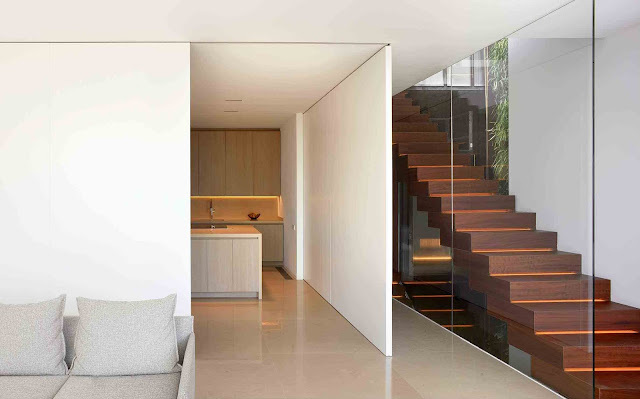 To the cover of the assembly is subtracted two volumes that make up the terrace and the patio. 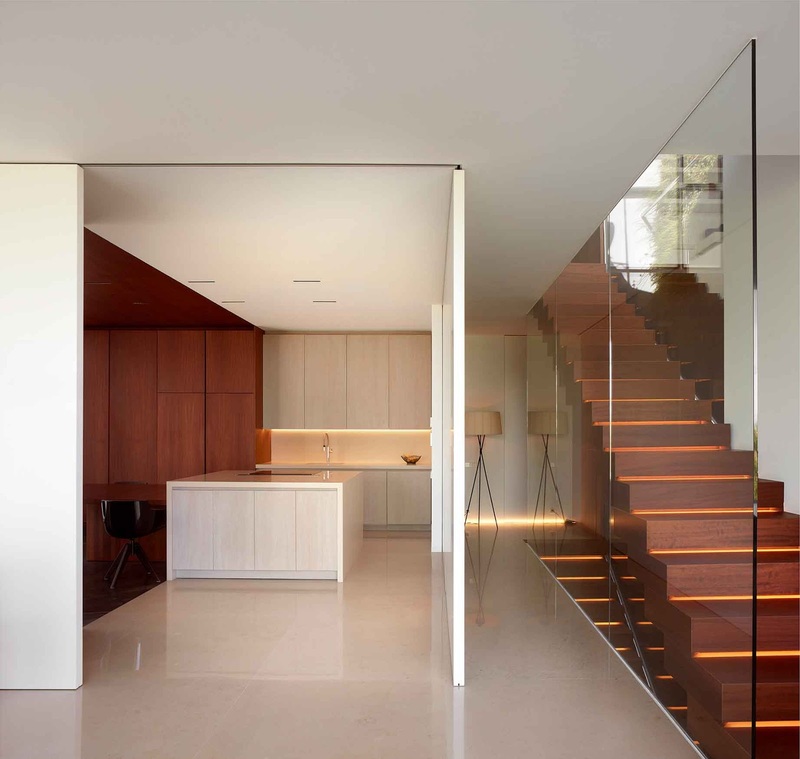 It proposes a house closely linked to the landscape thanks to the creation of spaces intended for contemplation. 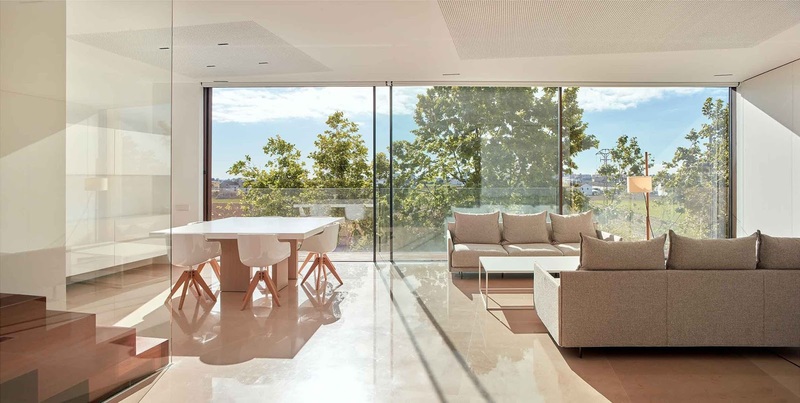 From the large window of the living room and from the terrace you get a panoramic view over the orchard that fades into the horizon. 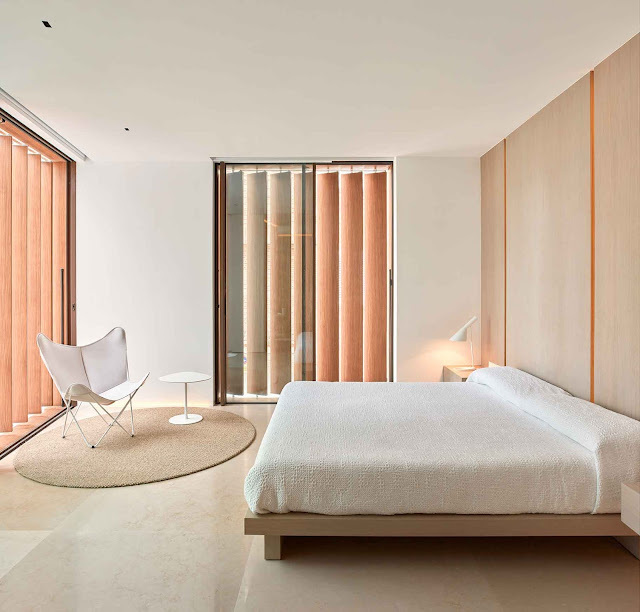 The nature of the project is characterized by its multi-colorism. 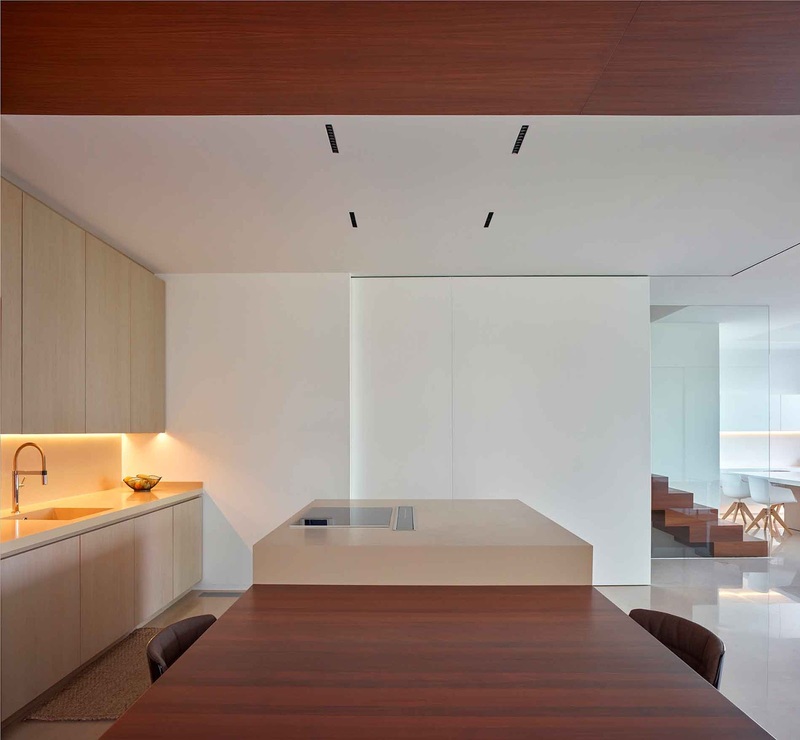 On a white canvas are highlighted some areas of wood and dark stone that marked the subtractions that are applied to the volume. 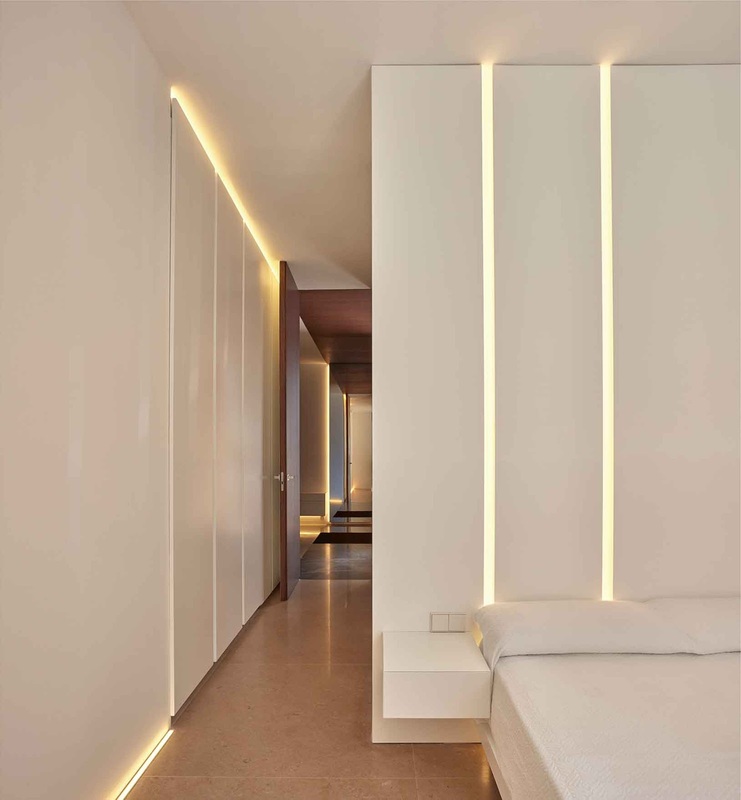 The light areas are materialized with white krion in the, a pavement of large format in a tone of sand and walls and ceilings painted in white. 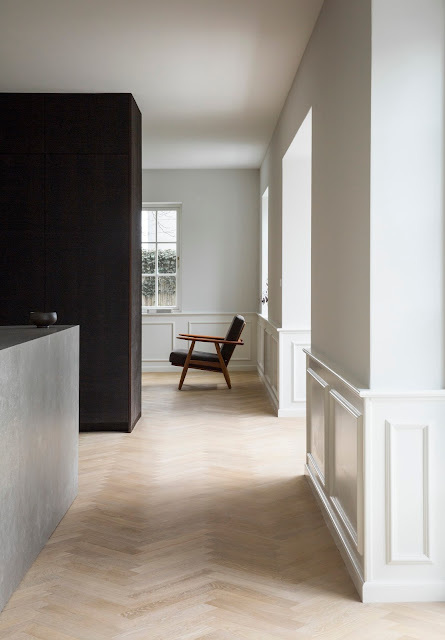 The dark areas are covered with panels of IROKO wood in walls, ceilings and cabinets and a dark brown stone on the pavement. The furniture is always coordinated with the tone of the space it occupies. The house consists of three oors with an attic at the surface and a basement. Access is through one of the splayed wooden openings. On the ground oor, you will nd the area of access, a garage, and a guest bedroom. On the rst oor are the bedrooms and on the second is the living room. This layout enables the common areas to have higher and distant views on the orchard. 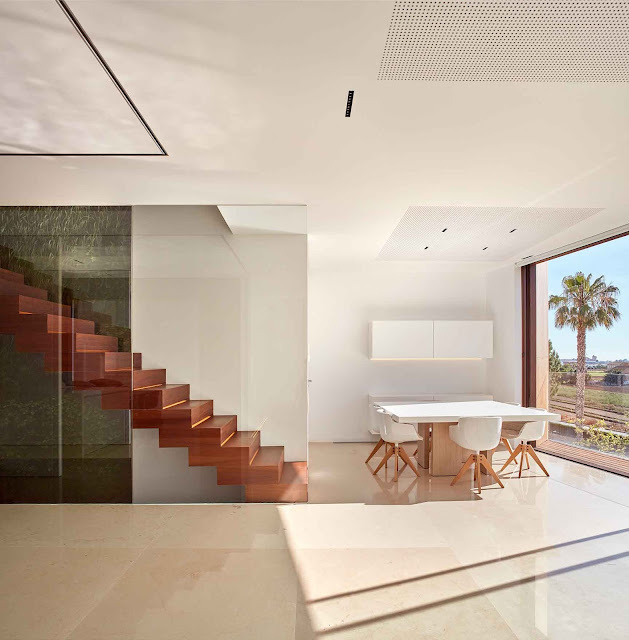 In the attic, there is a small studio and a terrace on the perimeter of the facade. 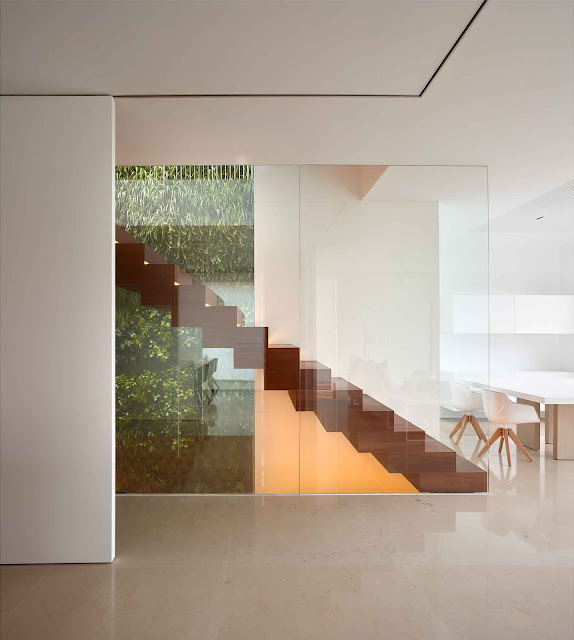 In the center of the house is located a patio where a vegetal wall articulates vertically around the setting. 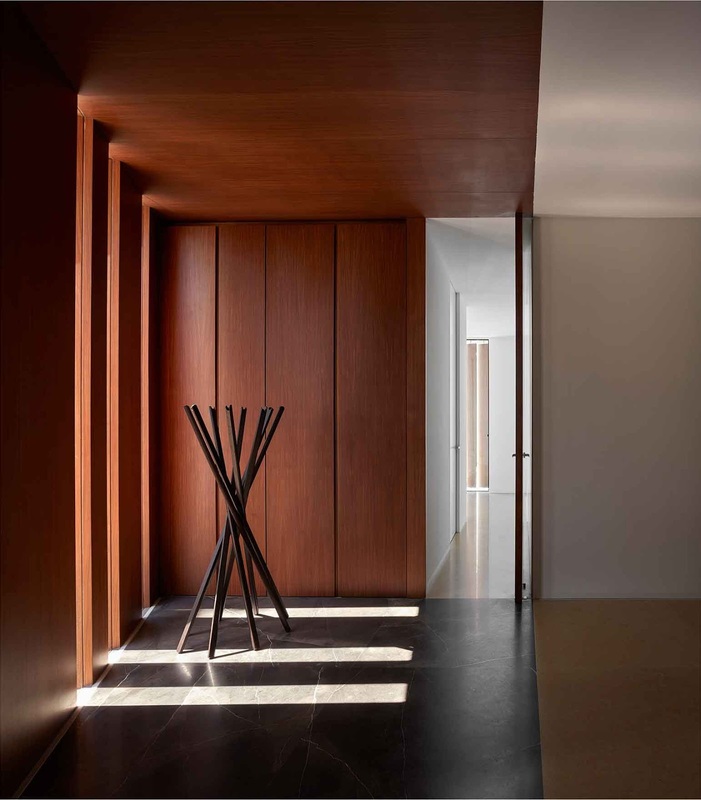 In addition to shedding light on the center of the house, it oxygenates and refreshes the environment thanks to the green texture generated at each plant. The housing is supplied by a system of wells of geothermal energy. In one of the slopes of the deck is placed a plate of a vacuum tube that provides supply to the elevator for low consumption, that connects the housing vertically. The façade openings are protected by a system of motorized and steerable planks. In the he large glazed surfaces, a double glass has been arranged with thermal and acoustic insulation with solar control. In addition, the housing has a surrounding of ten centimeters of rock wool, which ensures a high thermal insulation. All the lighting is dimmable led integrated in the architecture, so that the power consumption is very low. The whole house is controlled by a management system of home automation, from the air- conditioning and under oor heating to the degree of intensity of the illumination of the housing.